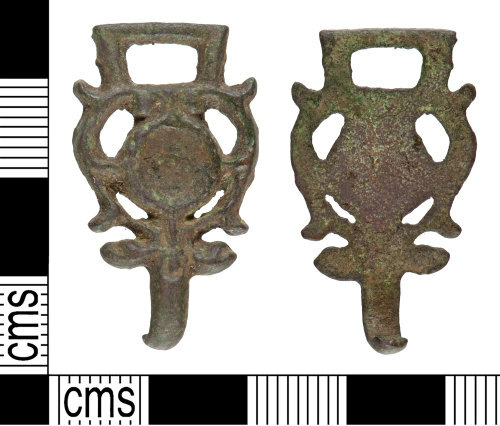 An incomplete copper-alloy dress hook of Post-Medieval date, c.AD 1500 - 1650. The dress hook is of Reads Class E, Type 3 being sub-circular in plan. The main plate is decorated with a moulded-relief openwork design featuring a raised linear circle with two elongated annular knops to both sides, and a swag at the juncture of the plate and hook. A rectangular attachment loop extends from one end and an incomplete D-sectioned hook extends from the opposite end. The hook terminates in a worn break. The reverse of the object is flat and undecorated. The metal has a dark green patina and is worn. The dress hook is 32.6mm long, 18.5mm wide, 2.2mm thick and weighs 3.9g. A similar example is illustrated in Read (2008) p.103, no.398 and is dated to the early Post-Medieval period.